Among the most striking objects in the universe are the dense, glittering swarms of stars known as globular clusters. Astronomers had long thought globular clusters formed their millions of stars in bulk at around the same time, with each cluster's stars having very similar ages, much like twin brothers and sisters. Yet the recent discoveries of young stars within old globular clusters have scrambled this tidy picture. Instead of having all their stellar progeny at once, globular clusters can somehow bear second or even third sets of thousands of sibling stars. Now a new study led by researchers at the Kavli Institute for Astronomy and Astrophysics (KIAA) at Peking University, and including astronomers at the National Astronomical Observatories of the Chinese Academy of Sciences (NAOC), Northwestern University, and the Adler Planetarium, might explain these puzzling, successive stellar generations. 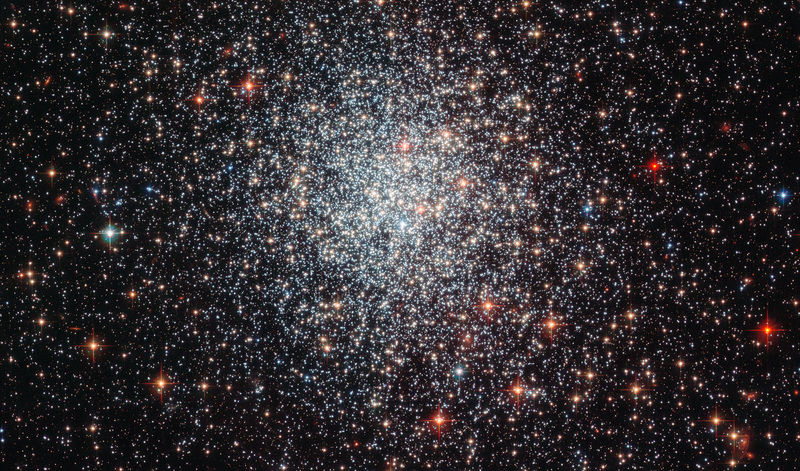 Using observations by the Hubble Space Telescope, the research team has for the first time found young populations of stars within globular clusters that have apparently developed courtesy of star-forming gas flowing in from outside of the clusters themselves. This method stands in contrast to the conventional idea of the clusters' initial stars shedding gas as they age in order to spark future rounds of star birth. The study is publishing today in the journal Nature. "This study offers new insight on the problem of multiple stellar populations in star clusters," said study lead author Chengyuan Li, an astronomer at KIAA, NAOC and affiliated with the Chinese Academy of Sciences' Purple Mountain Observatory. "Our study suggests the gaseous fuel for these new stellar populations has an origin that is external to the cluster, rather than internal." In a manner of speaking, globular clusters appear capable of "adopting" baby stars—or at least the material with which to form new stars—rather than creating more "biological" children as parents in a human family might choose to do. "Our explanation that secondary stellar populations originate from gas accreted from the clusters' environments is the strongest alternative idea put forward to date," said Richard de Grijs, also an astronomer at KIAA and Chengyuan's Ph.D. advisor. "Globular clusters have turned out to be much more complex than we once thought." Globular clusters are spherical, densely packed groups of stars orbiting the outskirts of galaxies. Our home galaxy, the Milky Way, hosts several hundred. Most of these local, massive clusters are quite old, however, so the KIAA-led research team turned their attention to young and intermediate-aged clusters found in two nearby dwarf galaxies, collectively called the Magellanic Clouds. Specifically, the researchers used Hubble observations of the globular clusters NGC 1783 and NGC 1696 in the Large Magellanic Cloud, along with NGC 411 in the Small Magellanic Cloud. Scientists routinely infer the ages of stars by looking at their colors and brightnesses. Within NGC 1783, for example, Li, de Grijs and colleagues identified an initial population of stars aged 1.4 billion years, along with two newer populations that formed 890 million and 450 million years ago. What is the most straightforward explanation for these unexpectedly differing stellar ages? Some globular clusters might retain enough gas and dust to crank out multiple generations of stars, but this seems unlikely, said study co-author Licai Deng of NAOC and Chengyuan’s second Ph.D. advisor. "The most massive stars that form in a globular cluster only live about 10 million years before exploding as supernovae, which blow away the remaining gassy, dusty fuel required for making new stars," Deng said. The KIAA-led research team proposes that globular clusters can sweep up stray gas and dust they encounter while moving about their respective host galaxies. The theory of newborn stars arising in clusters as they "adopt" interstellar gases actually dates back to a 1952 paper. More than a half-century later, this once speculative idea suddenly has key evidence to support it. "We have now finally shown that this idea of clusters forming new stars with accreted gas might actually work," said de Grijs, "and not just for the three clusters we observed for this study, but possibly for a whole slew of them." Future studies will aim to extend the findings to other Magellanic Cloud as well as Milky Way globular clusters. Other members of the research team include Yu Xin and Yi Hu of NAOC, Aaron M. Geller of Northwestern University and the Adler Planetarium, and Claude-André Faucher-Giguère of Northwestern University. The research is funded, in part, by the National Natural Science Foundation of China.